One of my first spindle loves were the drop spindles made by Golding Fiber Tools. The Goldings don’t just make drop spindles; they also make spinning wheels, weaving looms and other fiber tools (as implied by their name). The spinning wheels are incredible and very expensive. The spindles range from prices in the $50 range for the small basic spindles to about $300 for the more elaborate spindles with expensive materials. 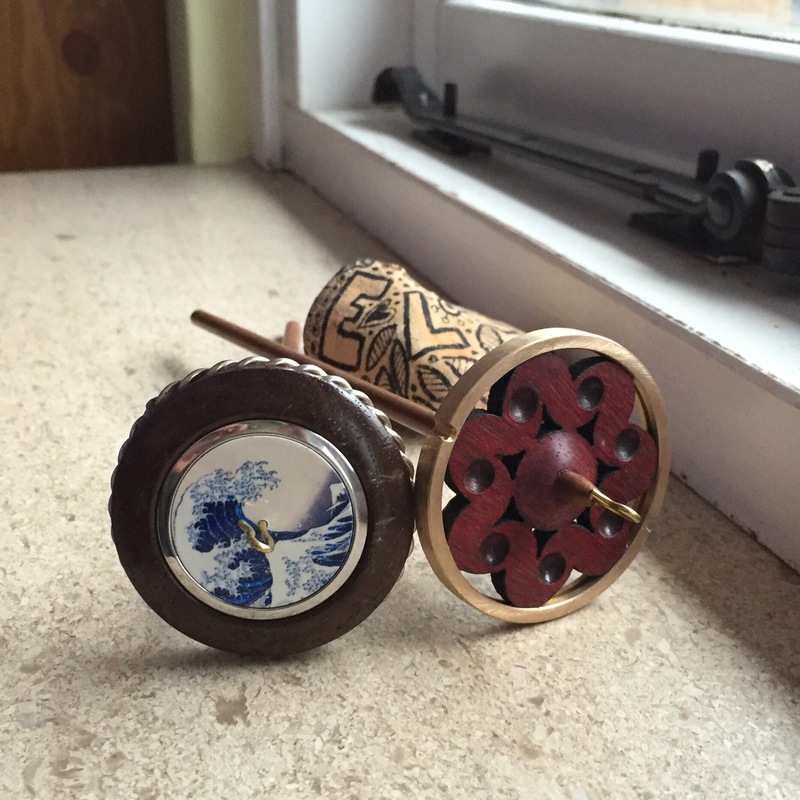 Great Wave is one of the ‘Vintage and Decorative’ Ring Spindles. This means that only a few (or just one) spindles are made with the design (2015-01-15: A spindle very simiar to mine is currently available at the Golding web site). The whorl of the Great Wave is made of walnut with a Sterling Silver ring. The spindle is quite heavy for it’s size weighing about 1oz/ 28g. I haven’t really found a great use for this spindle. 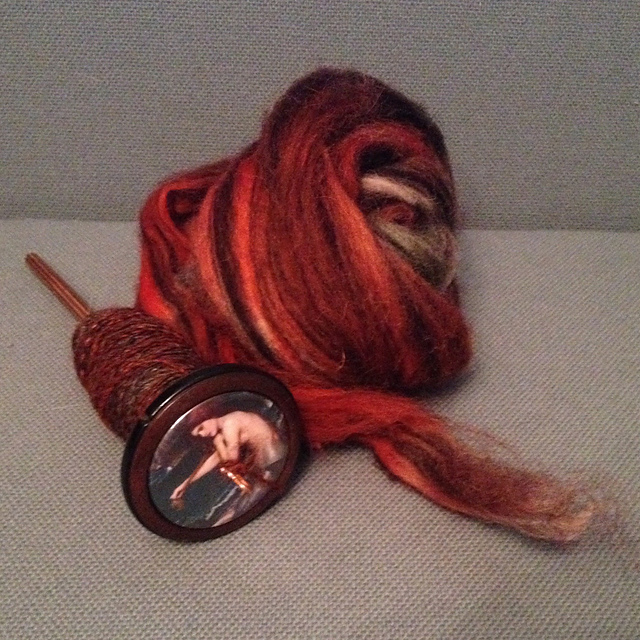 If I want a spindle that weighs 1 oz; I will usually pick one with a bigger whorl, so I can pack more fiber on it. It is very pretty though. Tsunami is one of the standard 2″ spindles. It is available in a 0.5oz and 0.8 oz version made of either Cherry or Purpleheart. Mine is the Purpleheart version (I have a larger Cherry Tsunami). I don’t spin a lot on this either, but I do see its uses for thin singles. The Bird’s Eye Maple spindle on the right is one of the standard RingSpindles. 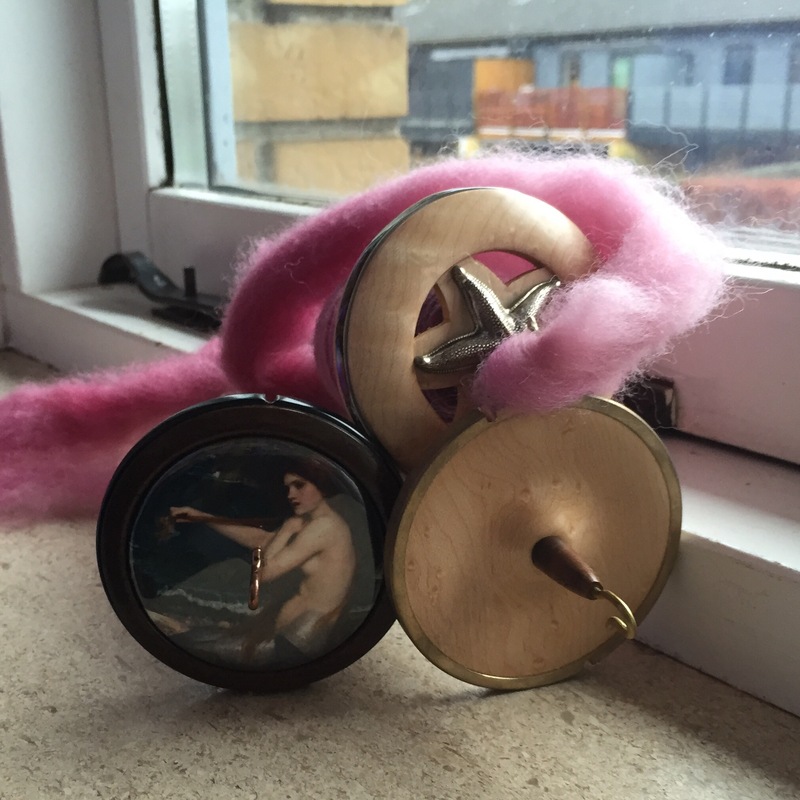 It is a real work horse spindle. Nothing fancy but with a steady, stable spin and a reasonable price. 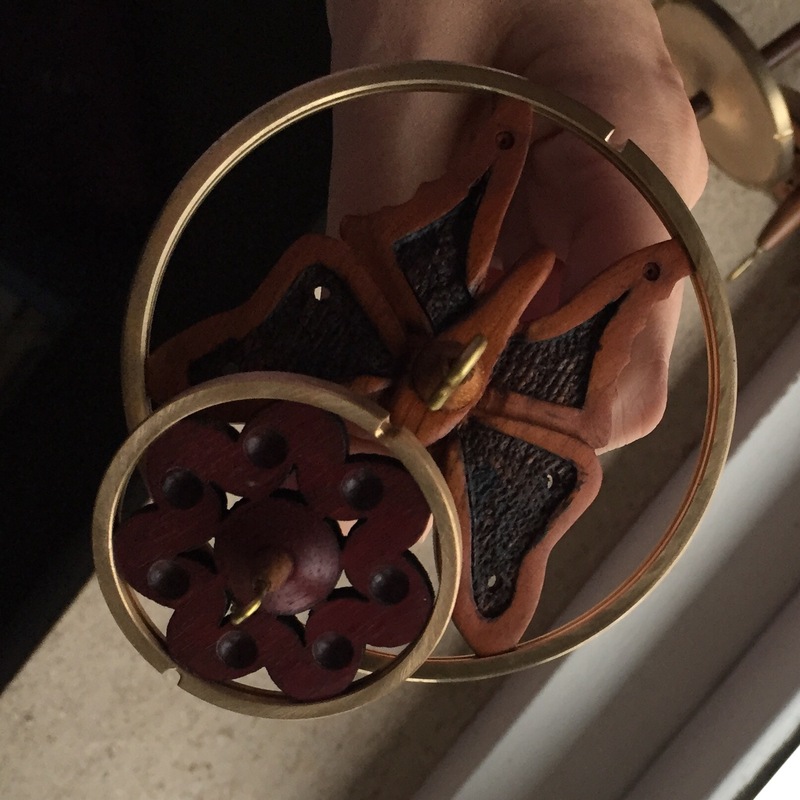 My Starfish spindle was my first true spindle love, and we are still madly in love (or at least I am!). It is another of the ‘Vintage and Decorative’ spindles, and as such was pretty expensive. 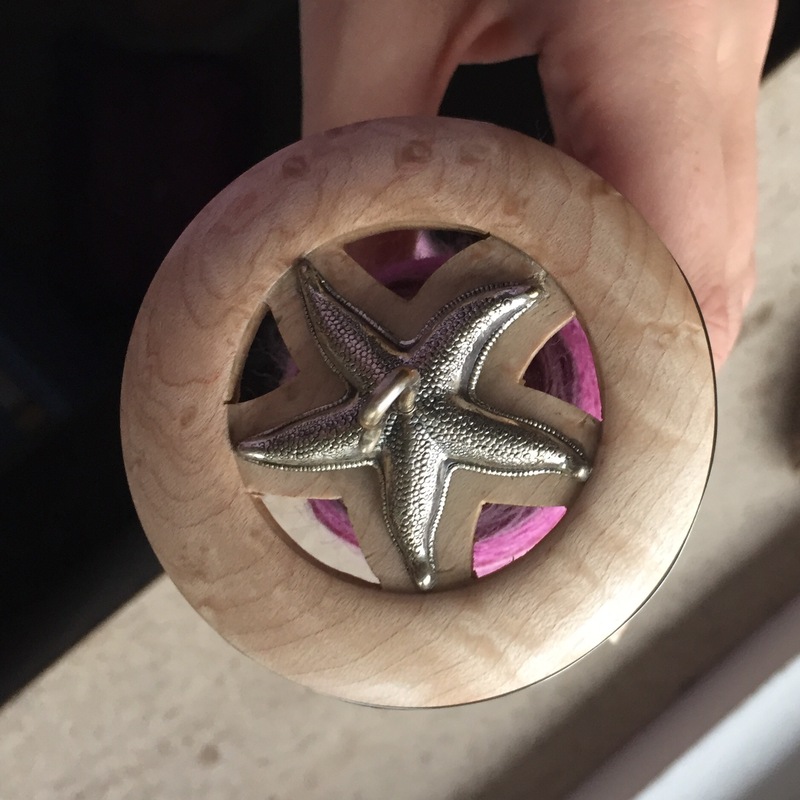 The whorl is made of Birds Eye Maple with a Sterling Silver Starfish and an abelone ring. The Starfish spins wonderfully and it is so very beautiful. It is in the top weight range of what I like to spin with (it weighs 1,4 oz), but still within that range. 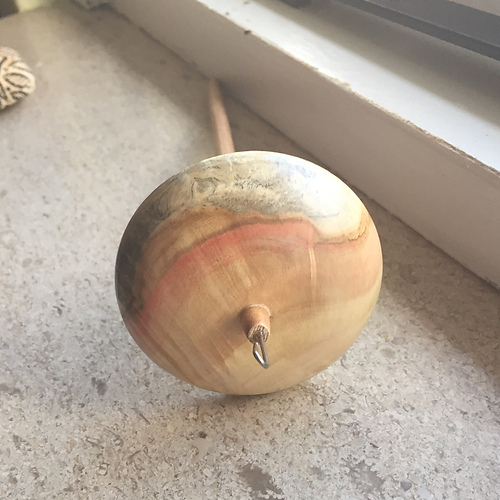 Mermaid spindle ready for some action! Oh, how gorgeous this Seaside Mermaid is. So gloomy and dark with her walnut whorl. She is on the heavy side for me (1.8 oz), and she appears to have a slight wobble when she spins. I use her for slightly thicker singles. 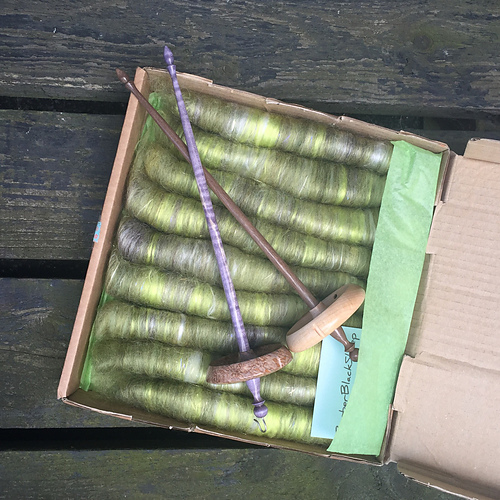 These are plying spindles for me, but I’m sure they are great for spinning thick singles as well. I purposely chose the lighter spindles since I don’t want them to be too heavy when plying a whole 4 oz of yarn on one spindle. 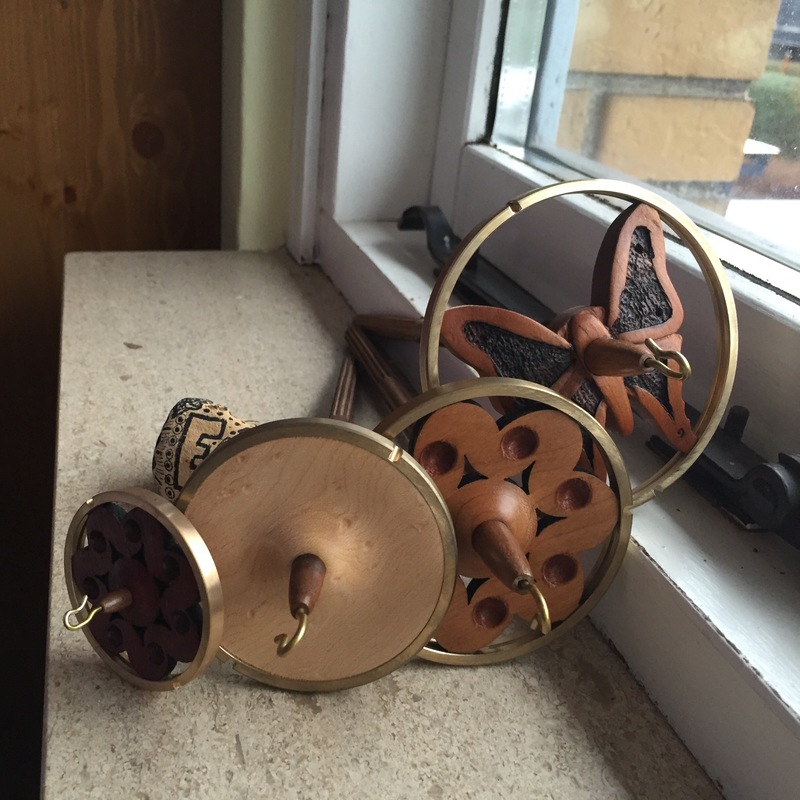 Both the Cherry Tsunami and the Butterfly are standard spindles. 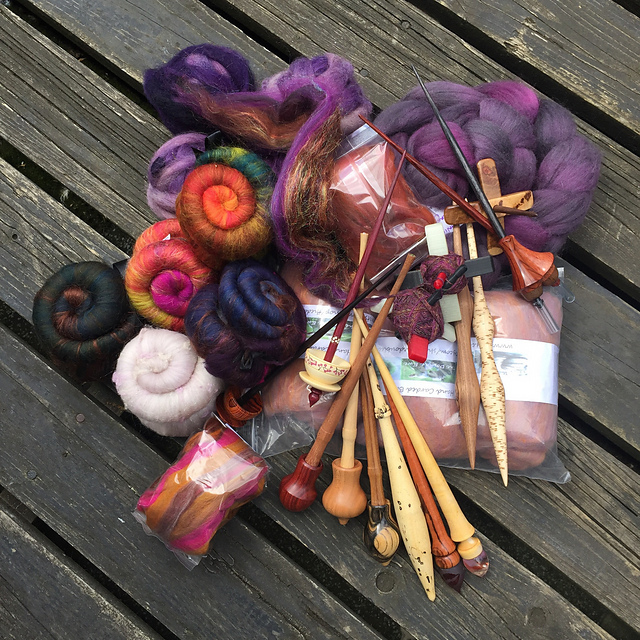 The Tsunami used to be my plying spindle of choice until I got my butterfly. I still use my tsunami for plying yarns when I have 3.5 oz or less. 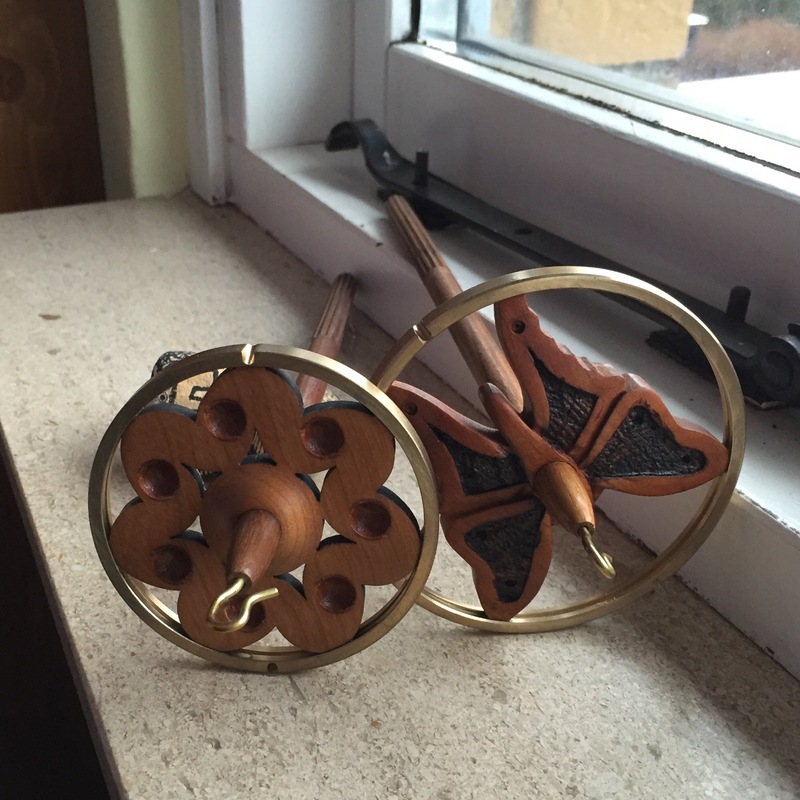 The Butterfly is one of my two favorite plying spindles (the other is a Greensleaves Mjolnir). It is big enough to fit 4 oz of plied yarn without trouble. 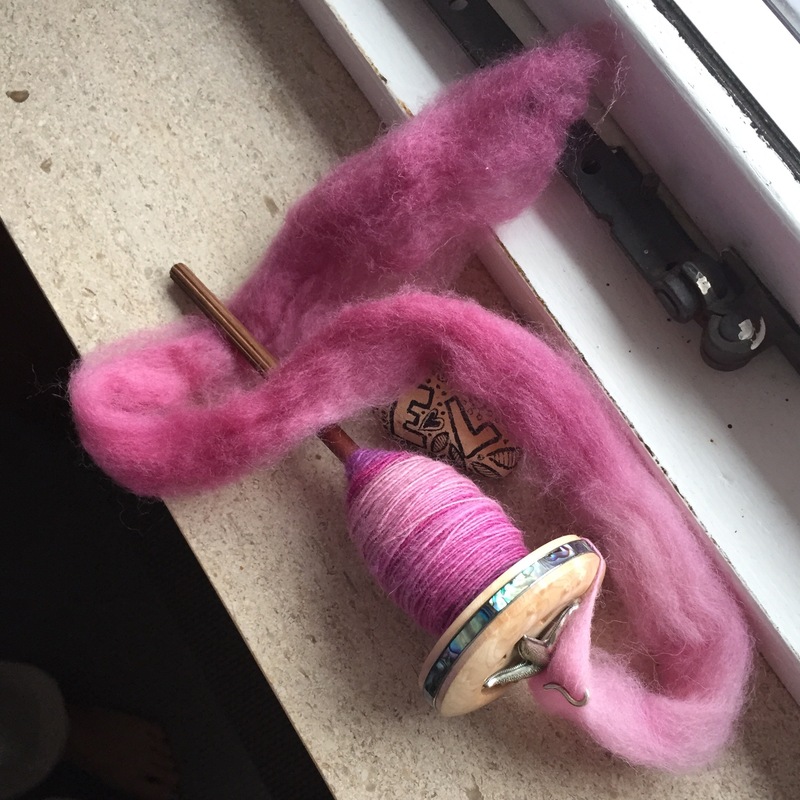 Both the Tsunami and the butterfly spin beautifully when loaded with yarn. Before I build a cop; the spin is a little sluggish and when they get VERY full they start to wobble, but they do a good job of what I bought them for. Comparing sizes: Smalles and largest. Overall I am very satisfied with my Golding spindles. There are a lot of choose from (I didn’t even touch on their special porcelain, scrimshaw, gemstone, or aromatherapy spindles) in different price ranges. For someone starting out with drop spindling; I would not hesitate to recommend one of the basic 2 3/4″ spindles. They would be a wonderful starting point that would continue to be useful.